Plastic bottles seem to be everywhere. And it is a great idea to recycle or upcycle them into useful items instead of throwing them away. Another advantage of plastic bottle crafts is their affordability. Still, you can create awesome designs using plastic bottles. Check out my plastic bottle baskets for instance. But here we’ll take a look at creating jewelry using plastic bottles and pieces of fabric. This is a set of handmade jewelry in blue: a plastic bottle crocheted over bracelet adorn with rolled fabric roses and a brooch. Here is a quick DIY tutorial for the plastic bottle bracelet. Cut out a slice of plastic bottle. Prick or melt holes on the edges of it. Then crochet it over with yarn. Done. It’s that easy. You can use color plastic bottle instead of transparent one. White plastic bottles can be easily decoupaged with napkins to make them look even better. Now you can decorate your plastic bottle craft with flowers and lace. 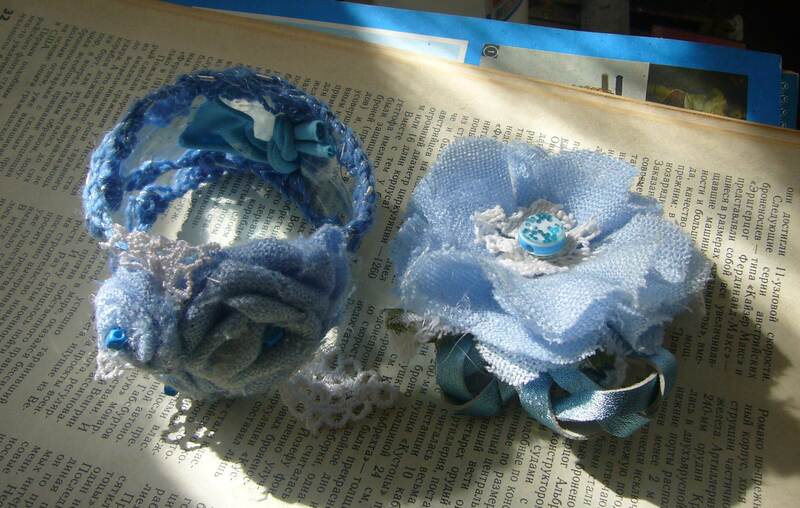 I used blue fabric to rolled these roses of and glued them to the plastic bottle bracelet. Now comes the blue brooch. It’s very easy to make. You cut out a paper circle pattern of the size you like. Then you cut out at least four fabric circles, fold them in four and glue them with hot glue gun or stitch them to the base. 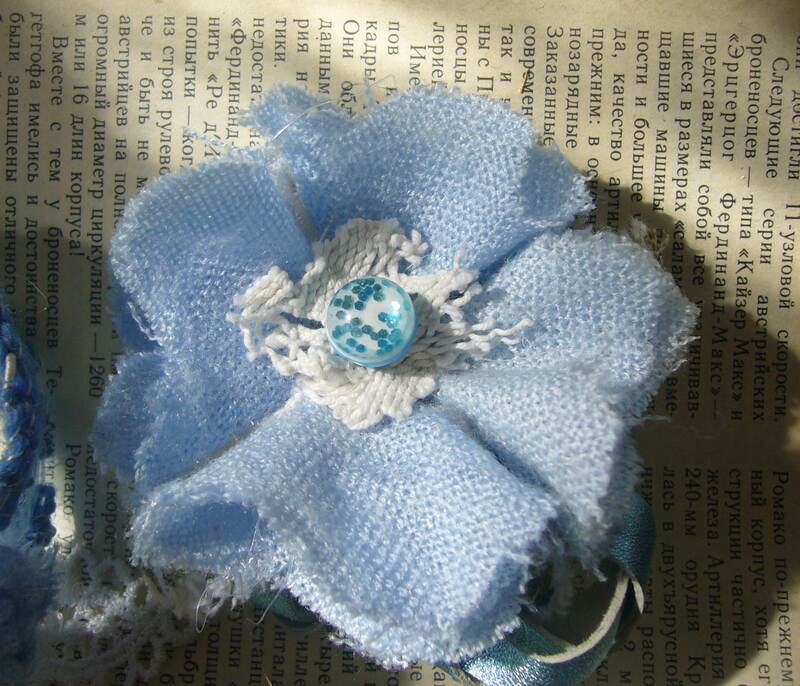 Then you may use beads, lace or ribbons to decorate your flower brooch. Glue the pin at the back side and it’s done. Check out my boards on Pinterest for more inspirations. I have a whole board of DIY fabric flower tutorials there. 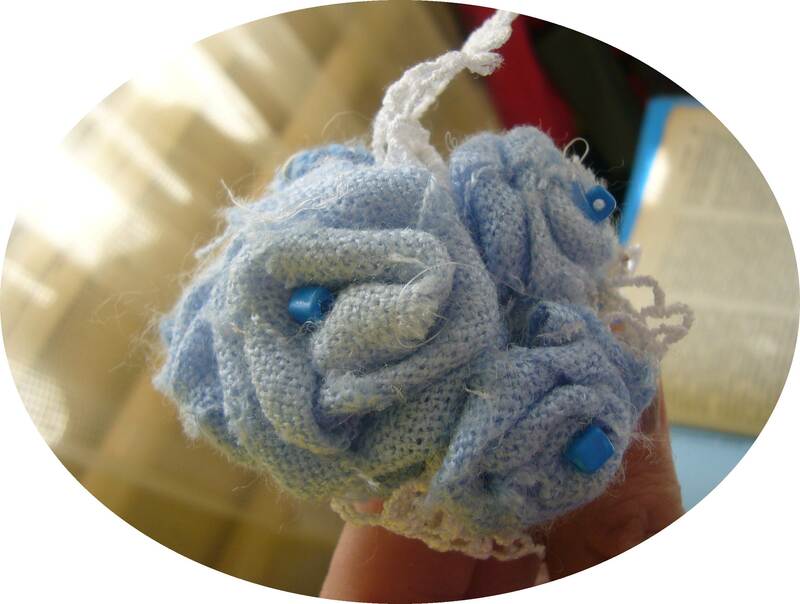 This entry was posted in Crocheting, Go green, Handmade jewelry and tagged crafts, DIY, fabric flower jewelry, fabric flowers, flower bracelet, flower brooch, handmade jewelry tutorial, pinterest, plastic bottle crafts, plastic bottle jewelry, recycled crafts, repurpose, upcycle. Bookmark the permalink.